Ravenna's 1,400 year old Basilica di San Vitale. The oldest — and best — mosaics in Ravenna are in the Mausoleum of Galla Placidia. 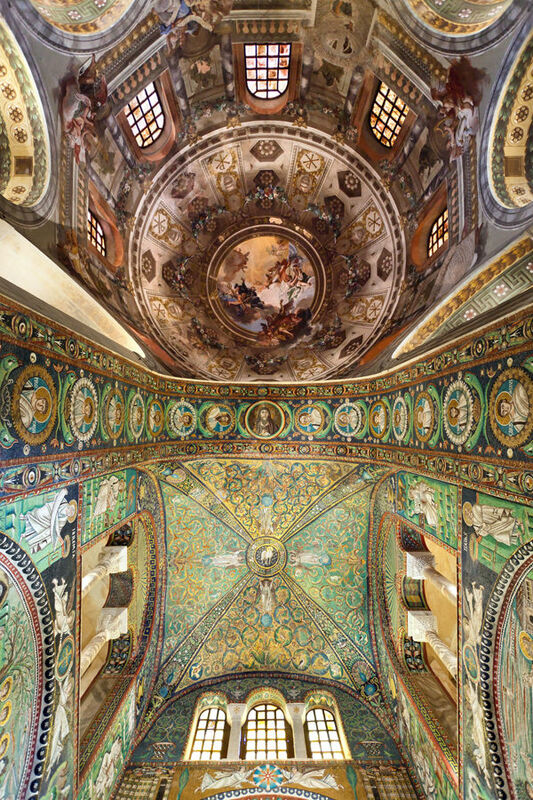 Ravenna is on the tourist map for one reason: its 1,500-year-old churches, decorated with best-in-the-West Byzantine mosaics. Known in Roman times as Classe, the city was an imperial port for the large naval fleet. Briefly a capital of eastern Rome during its fall, Ravenna was taken by the barbarians. Then, in A.D. 540, the Byzantine emperor Justinian turned Ravenna into the westernmost pillar of the Byzantine Empire. A pinnacle of civilization in that age, Ravenna was a light in Europe's Dark Ages. Two hundred years later, the Lombards booted the Byzantines out, and Ravenna melted into the backwaters of medieval Italy, staying out of historical sight for a thousand years. Today the local economy booms with a big chemical industry, the discovery of offshore gas deposits, and the construction of a new ship canal. The bustling town center is Italy's best for bi­cyclists. Locals go about their business, while busloads of tourists (mostly cruise-ship passengers and Italian school groups) slip quietly in and out of town for the best look at the glories of Byzantium this side of Istanbul. 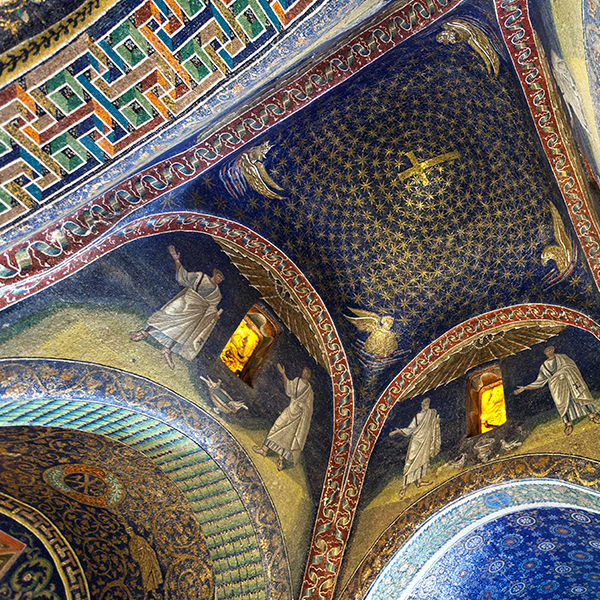 While the highlights of Ravenna can be seen in a four-hour stopover, the city can provide an entire day of relaxing and enjoyable sightseeing — particularly for mosaic lovers. 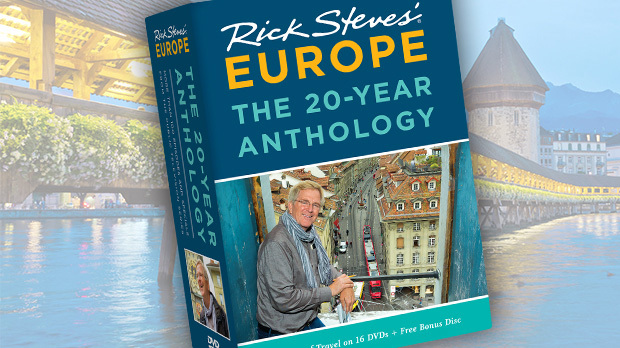 Its inexpensive lodgings and restaurants offer good value for your money. The town is a doable, though long, day trip from Venice or Padua (about three hours by train each way). It’s more pleasant to spend the night. 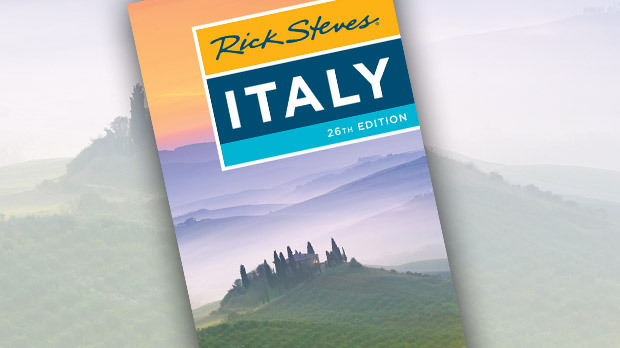 You could also stop here on your way from Venice or Padua to Florence. Ravenna is busiest between March and mid-June —prime field-trip season. Central Ravenna is quiet, with more bikes than cars, and a pedestrian-friendly core. On a quick stop, I'd see Basilica di San Vitale and its adjacent Mausoleum of Galla Placidia, Basilica di Sant'­Apollinare Nuovo, the covered market, and Piazza del Popolo. If you're day-tripping to Ravenna, remember — before you leave the train station — to jot down when the next few trains depart. If you're only visiting on a day trip, hit the ground running from the train station, and walk straight down Viale Farini to Piazza del Popolo. This square was built in about 1500, during a 60-year period when the city was ruled by Venice. Under the Venetian architecture, the people of Ravenna gather here as they have for centuries. Most sights are within a few minutes' walk of Piazza del Popolo. A right on Via IV Novembre takes you a block to the colorful covered market. Ravenna's two most important sights, Basilica di San Vitale and the Mausoleum of Galla Placidia, are two blocks away down Via San Vitale. Most sights close early in the off-season winter months; pick up a schedule from the tourist information office when you arrive. The Basilica di San Vitale, at 1,400 years old, is impressive enough on its own. But to see its brilliant mosaics still conveying the intended feeling that "this peace and stability was brought to you by your emperor and by God" is rare indeed. Study the scenes of apostles, the lamb on the twinkly ceiling, the beardless Christ astride a blue earth, and Emperor Justinian and his wife Theodora (an aggressive Constantinople showgirl who used all her charms to gain power with — and even over — her emperor husband) in their lavish court. San Vitale can be seen as the last of the ancient Roman art and the first of the Christian era. This church was the prototype for Constantinople's Hagia Sophia built 10 years later, and it inspired Charlemagne to build the first great church in northern Europe in his capital of Aix-la-Chapelle, now present-day Aachen. The Mausoleum of Galla Placidia, just across the courtyard from the basilica, is the humble-looking little mausoleum with the oldest — and, to many, the most precious — mosaics in Ravenna. The little light that sneaks through the thin alabaster panels brings a glow and a twinkle to the very early Christian symbolism (Jesus the Good Shepherd, Mark's lion, Luke's ox, John's eagle, the golden cross above everything) that fills the little room. Cover the light of the door with your hand to see the beardless Christ as the Good Shepherd. This was a popular scene with the early church. Ninety-five percent of the mosaics here are originals, dating from the late Roman period, when Ravenna was capital of a declining West.